Discuss and evaluate the statement that a 'multi-speed' Europe exists and that it would be essential for embracing an enlarged European Union. 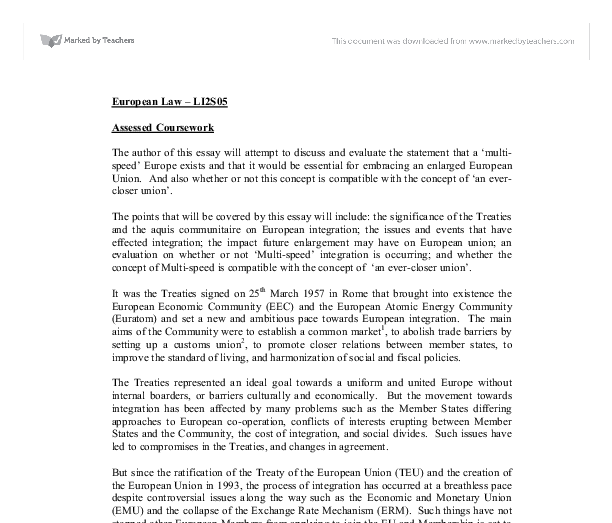 European Law - LI2S05 Assessed Coursework The author of this essay will attempt to discuss and evaluate the statement that a 'multi-speed' Europe exists and that it would be essential for embracing an enlarged European Union. And also whether or not this concept is compatible with the concept of 'an ever-closer union'. The points that will be covered by this essay will include: the significance of the Treaties and the aquis communitaire on European integration; the issues and events that have effected integration; the impact future enlargement may have on European union; an evaluation on whether or not 'Multi-speed' integration is occurring; and whether the concept of Multi-speed is compatible with the concept of 'an ever-closer union'. It was the Treaties signed on 25th March 1957 in Rome that brought into existence the European Economic Community (EEC) and the European Atomic Energy Community (Euratom) and set a new and ambitious pace towards European integration. The main aims of the Community were to establish a common market1, to abolish trade barriers by setting up a customs union2, to promote closer relations between member states, to improve the standard of living, and harmonization of social and fiscal policies. The Treaties represented an ideal goal towards a uniform and united Europe without internal boarders, or barriers culturally and economically. But the movement towards integration has been affected by many problems such as the Member States differing approaches to European co-operation, conflicts of interests erupting between Member States and the Community, the cost of integration, and social divides. Such issues have led to compromises in the Treaties, and changes in agreement. But since the ratification of the Treaty of the European Union (TEU) and the creation of the European Union in 1993, the process of integration has occurred at a breathless pace despite controversial issues along the way such as the Economic and Monetary Union (EMU) and the collapse of the Exchange Rate Mechanism (ERM). ...read more. This principle of EC supremacy or primacy was also confirmed by Simmenthal27 and refined by Factortame28. As well as upholding the primacy of Community law the Member States also have an obligation to ensure that no national legislation gets in the way of its effectiveness. If that Member state failed to comply they may face a challenge from the Commission under Article 226. The trend towards greater encroachment of Community powers into national law was however greeted with negative public opinion during the mid-1980's. This threatened to erode the degree of popular consent needed to maintain the Community's move towards integration, so the concept of subsidiarity was introduced into Community law by SEA. Subsidiarity 29 is the idea that the Community should only intervene when the objectives cannot be achieved at national level, and/or a better result can be achieved at a Community level. Subsidiarity can be raised as a defence by the Member State in the ECJ.30 Subsidiarity can act as an obstacle towards greater integration, an example is the Charter of Fundamental Rights which emphasises this principle under Article 51, and Article 52 goes onto include a derogation clause, which allows limitations to the exercise of those rights and freedoms. So far Europe is split over whether to give the Charter legal status, only 5 EU Members have signed up fully for it. With enlargement unanimity and uniformity with 25 Members this would be even more difficult. The legal systems of most Member states can be divided into two categories: Monist and Dualist. In Monism both Community law and national law is form part of the same legal order, but Community law takes precedence over national law. With dualism Community law and national law make up two separate legal bodies. Community law can only become part of national law through domestic legislation. When Community law is being applied through these two systems there isn't much difference. ...read more. So in response to the statement made, we can agree that a 'multi-speed' Europe would be a necessity for 'an ever closer union', but in practice this is not the model of integration that Europe is currently reflecting. 1 Art. 2 EC 2 Art. 12-17 EEC 3 Art. 2 (ex Art. B) TEU. 4 Art. 7 E.E.C 5 Arts 11 - 28 TEU. 6 Arts 29 - 45 TEU. 7 Art. 95 (4), EC 8 (260/89) Elliniki Radiophonia Tileorassi AE v Dimotiki Etairia Pliroforissis (1991) ECR I-2925. 9 Protocol No.25, 1992, EMU and United Kingdom, TEU. 10 Protocol No.26, EMU and Denmark, TEU. 11 Protocol No. 2, 1997, Schengen Aquis, TEU. 12 Art. 220 (ex 164), EC 13 Art. 226 (ex 169), EC. 14 (100-103/80) Musique Diffusion Francaise v Commission (1983) ECR 1825. 15 (387/97) Commission v Greece (2000) ECR I-5047 16 Art 3(1)(h) (ex 3(h)) E.C., harmonisation referred to as "Approximation" 17 (41/74) Van Duyn v Home Office (1974) ECR 1337. 18 Art. 95 (ex Art. 100a), EC 19 (242/87) Commission v Council (1989) ECR 1425 20 (96/81) Commission v Netherlands (1982) ECR 1791 21 (22/70) Commission v Council (1971) ECR 263. 22 (9/74) Casagrande v Landeshaupstadt (1974) ECR 773. 23 Arts. 29 - 31 (ex Arts. K.1 - 3) TEU 24 Art. 10 (ex Art. 5) EC. 25 (26/62) Van Gend & Loos v Nederlandse Administratie der Belastingen (1963) ECR 1. 26 (6/64) Costa v ENEL (1964) ECR 585. 27 (106/77) Amministrazione delle Finanze dello Strato v Simmenthal (1978) ECR 630. 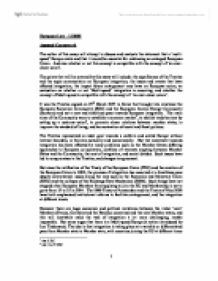 28 (C - 231/89) R v Secretary of State for Transport, ex parte Factortame (1990) ECR I-243. 29 Art. 5 (ex Art. 3b) EC Treaty. 30 (C - 84/94) UK v Council (1996) ECR I-5755 31 Art. 6 , EC Treaty. 32 (68/88) Commission v Greece (1989) ECR 2979. 33 (361/88) Commission v Germany (1991) ECR I-2567 34 (70/85) Kwerkerij Gebroeders Van der Kooy BV v Commission (1988) ECR 219. 1 ...read more. From this perspective, the deficit appears to be 'psychological'. Indeed, the large scale of the EU means it is more difficult for effective participation of citizens, with the uncertain public opinion unsurprising in the face of the transfer of policy responsibility from state to the European Government. Furthermore, the EU has done much work in the establishment of human rights. within government, De Gaulle accused Britain of not acting in a European way and the application was rejected. Wilson tried to apply in 1967, but after six months it was rejected by De Gaulle. He wanted to join the EEC because Britain was facing an increasingly worse economic situation, also the strength of sterling was still lowering. Not only the stress for the need for a military capability but also the creation of the Political and Security Committee, the Military Committee (with military staff) and a secretary general was more than the U.S. would absorb since for most (especially the U.S.
of syphilis at the end of the 15th Century had huge economic implications and have shown to be a catalyst for witch trials. The idea that witches could cause disease was fuelled by the outbreak of syphilis at the end of the 15th Century. I did not manage my self and resources properly because I did not phone the mulberry the centre to get the website address to get information Next time i should use the university computer to contact the tutor about thier phone number so i can get the website address. Simultaneously, those responsible for external, humanitarian, development and assistance affairs as well as EC General Directories, showed total lack of interest for putting policies into practise. This was partly because policy objectives and priorities in these arenas differ from those of home ministers.